Connor has been totally random in science lately, going off in a lot of directions. So, for 2010, he is going to get back on track with Apologia Physical Science. He is also going to be pursuing something else. What? I don't know. He has a few options. I think he's going to be casually reading through Evolution: The Grand Experiment. And he is working on his Environmental Science merit badge with a group at Scouts. He has his eye on a couple other science merit badges too. William and Thomas are working in a Christian Kids Explore book. Anybody else unschool science for their science-loving kids? Richard & Trina are doing some things from the two Sonlight PreK cores... mostly the Core P4/5 science materials. They have the only Berenstain Bears book that I actually like. We've been totally blessed with some fantastic music resources lately. My older kids are using Kinderbach to teach the younger two (and learning a fair amount in the process) and will be doing that through January (watch for a review in early February). We'll also be studying Brahms and Schubert in some detail, thanks to this package from Zeezok Publishing. I put some additional music on hold at the library, and we'll be spending January studying Brahms, and in February we'll study Schubert. Watch for a review in another few weeks. We received more Maestro Classics titles for Christmas, and we'll be working through those too. Connor has asked to learn to play the piano. I'm still working on the acquisition of some resources so he can do that. It will start with our keyboard (which is full-sized as far as the keys, but it is short about an octave from a real piano). It would be amazing to get a "real" full keyboard again. Might even get me back into playing. Connor will continue his Latin class. He will continue using Fallacy Detective for logic (and maybe we'll use the logic text in Eclectic Education also). All three big boys will continue programming computer games with Tektoma. And everyone will continue to do other miscellaneous things here and there. Installment #3 of my 2010 curriculum planning. This one is easy. History. First, I need to make a statement about my homeschooling philosophy. I believe in reading aloud. A lot. And for me, it is easiest to frame those read-alouds around our history studies. So "history" isn't just history. It is a pretty big chunk of our schooling because it is the vehicle I use to spend an hour or two reading aloud to my kids. Each day. I'd recommend Jim Trelease's The Read-Aloud Handbook if you want to hear someone who can phrase a lot of what I believe in a better manner. 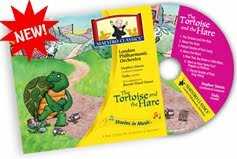 We read a lot of stuff -- historical fiction being a big part of it, but also biographies, modern "classics," fairy tales/folk tales from various parts of the world, classics either set in the time period we are studying or by authors of the time period we are studying, poetry, and a lot of "just fun" books too. I was totally, totally blessed back in September to receive Illuminations from Bright Ideas Press as part of the Review Crew. My plan for this year had been for Connor to use Sonlight Core 6, Richard and Trina to use Sonlight Core P3/4, and to do something with William and Thomas. We have totally loved Sonlight. But up through August, we have been able to make one core work for everyone. We started our new plan, with Connor moving off on his own... and it was really, really difficult. It totally messed with family dynamics, and I felt overwhelmed. And then came Illuminations. So now Connor is doing the high school level, William and Thomas are doing the 3rd-8th grade level, and Richard and Trina are doing the Early Learners materials. Everyone does the same basic history (Mystery of History Volume 1), and everyone is doing the same family read aloud. Everyone does the same Humanities and Geography. The three big guys are doing grammar together as well. It's great, we love it. However, even though I'm reading aloud a bunch (Mystery of History, the family read-aloud, the 3rd-8th read-alone, the Early Learners literature, the 3rd-8th grade optional readings), and Connor is doing the high school literature himself, it has not been enough. And I think the history is a bit light for high school. So Connor is also doing Core 6 (minus the titles included in Illuminations) at about half-pace. So that is the plan at the moment. Tomorrow I'm going to cover a bunch of miscellaneous subjects, including science and music. In addition to the Discover Career Planning site that ACT Advantage provided me earlier this year, they also sent their EXPLORE and PLAN tests for us to review. What are they? Well, these are tests based on the ACT, but meant for 8th-9th graders (EXPLORE) or 10th graders (PLAN). The tests are shorter than the ACT, and help you and your student see how he is doing in four areas: English, Math, Reading and Science. Our experience: Well, Connor (age 12) is a bit tired of doing tests after the SAT review course and the various college and career planning resources we have reviewed. So my normally cooperative child really didn't want to do these. He had to anyway (mean Mom!! ), though I only had him do the Explore test at this point. The test consists of four 30 minute sections, and there is guidance in the back of the book to help you score the tests. This helps you to correct the test, get a raw score, convert to a scaled score, and figure out how that compares with 8th or 9th graders. We did learn a bit. #1 -- a child who is not motivated and has distractions present is going to score horribly. Especially when he is too distracted to even answer most of the questions. #2 -- this particular child will still manage to blow away the reading and science sections, even compared to 9th graders. #3 -- if we are going to have him take either the SAT or ACT this year, we really should choose the ACT. 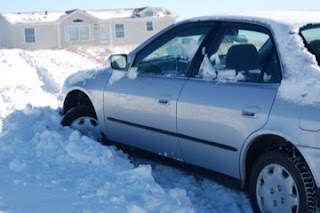 Going forward, Connor will be doing the PLAN test in the first week or so of January. Then we'll decide if he should take the ACT this year. The reason we are considering the SAT or ACT is that the standardized tests we do to meet state requirements really tell us nothing. 99th percentile is great and all, and I'm not knocking that. But we're just at a point where doing out of level testing sounds like it would actually give us useful information. Maybe just doing the PLAN test is actually going to give us enough and we won't have to go further. But if he is scoring at the 95th percentile and above compared to 10th graders, well... we will know that we want more, and he will be doing the ACT for real. Bottom line: I think this is a great in-home way to accomplish a couple different things. One is what the test was designed for -- to get some early indication of how your child is likely to do on the ACT. The other is to be able to do some above level testing of a child who is topping out the grade-level testing in an informal setting. At $23 per test, it is not terribly expensive either. And it is certainly less stressful than registering for tests in an unfamiliar setting. Bottom line: I'm glad to have had the chance to use ACT Advantage with Connor. It is something I will use with the rest of my children too. Disclaimer: As part of the TOS Homeschool Review Crew, I did receive both the EXPLORE and PLAN test packets from ACT Advantage. The fact that I received a complimentary product does not guarantee a favorable review. It does guarantee a review. A fair review. But I am not going to praise something unless I think it deserves the praise. If I don't like it, you'll hear that. And hopefully with enough detail as to why so you can decide for yourself if what I hate about it makes it perfect for your family. For more about my take on reviews, visit my blog post here. On Monday, we had a big scouting night. 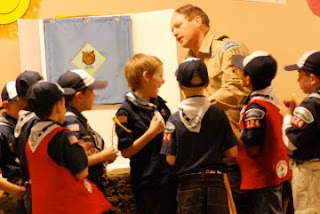 The Cubs were having a Christmas party, but Thomas was the only one who was able to attend that, as the Boy Scouts were having the Court of Honor that was cancelled last week. Since I was the only one there (Dale couldn't get off a second week in a row, and my parents had left), the pictures are not that great. 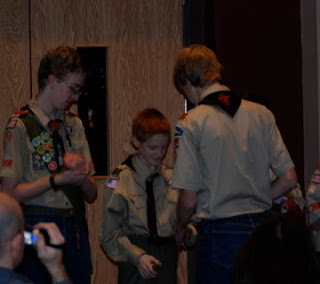 I had to be up front when the boys were awarded with their ranks, so we didn't get pictures of that at all. I'll post pictures of both of them when I get the new badges sewn on though. 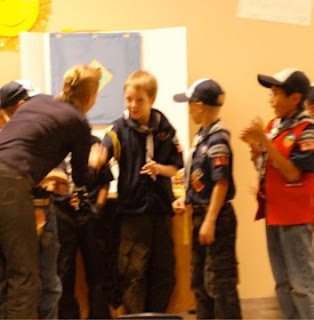 Anyway, up first was William, along with three other boys, receiving their Scout rank. That's the first rank that the kids can earn. They worked through the ranks, with a couple of kids earning Tenderfoot and Second Class. Then it was Connor's turn. 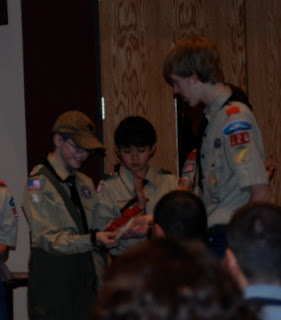 Four boys, including Brian (who joined Webelos back when Connor did) all received their Star rank. Star requires a fair amount of work, including at least six merit badges -- and four of those have to be Eagle-required ones. A couple of the boys made Life too, which was presented next (including the tall one standing next to William below). Then they called up about half the troop to receive merit badges. There were a LOT of merit badges presented on Monday. Including a few to our household. Here is William receiving Photography and Fingerprinting. And here is Connor receiving Camping and Fingerprinting. What a great night! Maybe next Saturday I can post pictures of all three of my scouts in their updated uniforms. 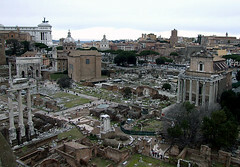 My son had to put together a commercial advertising a trip to Ancient Rome for his Latin class. Seeing as we don't own a video camera, and seeing as he loves any chance to do some programming and call it school, this is what he came up with. If you happen to have an account at Scratch, I'm sure he'd be tickled to get some comments there. If not, here works too. He put some serious work into this. And yeah, that's me as the narrator, promising to sell unruly children into slavery. 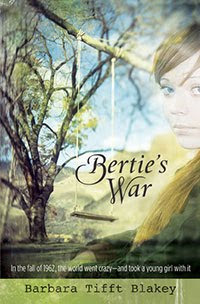 Bertie's War, by Barbara Tifft Blakey, showed up in my mailbox a couple weeks back. It was tough deciding what to do with it... but I ended up sitting down and reading it myself for purposes of this review. I think that was the right decision for us right now. At just under 200 pages, it was a pretty quick read for me. Reviewing fiction is hard. I want to tell you enough to get a flavor for the book, but I don't want to ruin the story either. Well, here goes. Bertie (Roberta) is starting 7th grade, in 1962. I have to admit, this is the first historical fiction I've read set during the Cuban Missile Crisis. This is not an era I know a lot about, but some of what I read really struck a chord with me. I recall (a decade later) doing nuclear attack drills in school. I remember how incredibly scary that was. There is a school drill described in the story, and oh, I was so right there. I thought the author nailed it in that description. I vaguely remember discussions about bomb shelters too, though to the best of my knowledge, my family did not have one. I distinctly remember signs in certain public buildings announcing where the fallout shelter was. Anyway, the pervasive fear of nuclear attack was communicated well in the story. But for Bertie, it isn't just fear of the Commies and nuclear blasts. She is afraid of everything. All of the time. Her fear controls her life. The plot takes a few twists and turns -- including some I wasn't exactly expecting -- and comes to a happy ending. The ending, though, might have been a little too perfect. It was a bit too much of "and they all lived happily ever after..." for me. Do I recommend it? Well, I'm not dropping everything to have my kids read it right now. Look at the "Books we're reading" box on the left... Cat of Bubastes (Ancient Egypt), Classic Myths (Ancient Greece mostly), The Trojan War (Greece & Troy). I'm just not up to fast forwarding that many millennia right now. But when we do get to the Twentieth Century again? Yes, I will pull this book out and add it to our mix. I think it will be great for the glimpse into the strain of the times. And I think there are quite a few other conversations we can have. Focusing on others. Parenting styles. Real fears vs. imagined ones. And I think I could have fun coming up with some writing assignments for my boys from this. Along the lines of "Rewrite this incident from Dad's point of view." Or from her little brother's viewpoint. Because this would be a totally different story through the eye's of anyone but Bertie. 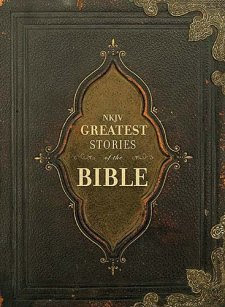 The book is available from the publisher, Kregel Publications, for $8. Disclaimer: As part of the TOS Homeschool Review Crew, I did receive this book for free from Kregel Publications. The fact that I received a complimentary product does not guarantee a favorable review. It does guarantee a review. A fair review. But I am not going to praise something unless I think it deserves the praise. If I don't like it, you'll hear that. And hopefully with enough detail as to why so you can decide for yourself if what I hate about it makes it perfect for your family. For more about my take on reviews, visit my blog post here. 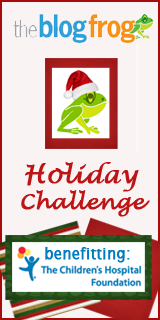 BlogFrog. It's something I joined fairly recently, and I am having a bit of fun with it. You can see stuff about it down on the left side of my blog -- most recent discussions, people who have been visiting my blog, etc. Right now, they are doing a promotion. For every "community" that gets 20 new participants during the remainder of 2009 (that means someone who posts a comment or starts a discussion on my community page), BlogFrog will donate $10 to The Children's Hospital. Each of those communities also is entered into a drawing for a $100 Target gift card. So -- hop on over to my community here. Post a comment. Start a new conversation. Help me to help the Children's Hospital. Creating your own computer games. Now that is something that my boys can get excited about. And they did, and still are. Tektoma is an online subscription site that offers tutorials in the use of GameMaker software. My two oldest boys (7th and 5th grades) found the tutorials very easy to use, though since it can only be done on a PC, I did have to help them a bit with things like where to save the files. Both sat down with the first tutorial, to make a simple racing game, and worked through it in a few hours. My third grader really wanted to create his own games too, and he has needed a bit more hand holding. I think if he could have used a Mac, he would have been very independent. But I want them to be familiar with PCs too, and this is one way to motivate them to do that. And then there are a number of mini-tutorials that help you do some other things -- like make the game into an .exe file, or how to make it operate in full-screen mode, or how to pretty it up with some customized stuff. What does it cost? There is a free 14 day trial, and after that, you can subscribe for $15 per month, or $140 for a year. If you join using this link (the other links in this post are non-affiliate links if you'd prefer that), I get another 15 days tacked onto my membership. My kids would love you forever. :) The other "cost" is that you need to download GameMaker, the program that these tutorials are designed for. There is a lite version, which is free -- and all that is required for the Tektoma tutorials. We're seriously considering an upgrade to the pro version though, for $25. What I love about Tektoma so far -- my kids are very excited about this, and I love the exactness that computer programming types of things require. They have to pay attention to detail, or they end up with lousy results. I love that they can work with some cause and effect, and a whole lot of logic. There is plenty of math involved too -- algebra, geometry, even some very, very basic calculus. And Tektoma's tutorials are designed for kids. I really appreciate that none of the tutorials are teaching them to make gory shooting type games, though some do involve 'lives' and the like. And while the tutorials are fairly lengthy (the shortest "full" tutorials are over an hour, and I'd think to actually do the work, you probably need to at least triple that), it is really easy to just do a section or two in a sitting for those shorter attention spans (my 3rd grader doesn't want to work at it for more than about a half hour in a sitting, for instance). You do need to download a few things before you get started, but we didn't have any hassles with that part. And if you don't upgrade GameMaker, you will see stuff encouraging you to upgrade to the paid version. My kids are able to ignore that fairly well. Bottom line: we are loving this. I think this makes my "Top 10" list so far. We will consider extending our subscription by a month or two when it is up in February, depending on how far the boys get with it in the next few weeks. My boys are already making plans for creating games of their own. Something about Around the World in 80 Days, something that takes place in ancient Rome, cells fighting off infections, and I don't remember what all else. Everything they've mentioned has been very literature, history, or science heavy. Disclaimer: As part of the TOS Homeschool Review Crew, I did receive a three month subscription for free from Tektoma. The fact that I received a complimentary product does not guarantee a favorable review. It does guarantee a review. A fair review. But I am not going to praise something unless I think it deserves the praise. If I don't like it, you'll hear that. And hopefully with enough detail as to why so you can decide for yourself if what I hate about it makes it perfect for your family. For more about my take on reviews, visit my blog post here. It's been a great day. My two oldest kids had appointments at the eye doctor. Connor desperately needs new glasses, and I was quite panicked about how we'd end up paying for them. And William hasn't been to the eye doctor since his vision therapy. Well -- Connor's prescription has barely changed, so the first blessing is that his vision appears to actually be fairly stable. And -- our vision coverage must have changed, as his glasses cost us cost about 20% of what I remember paying last time. Hallelujah! 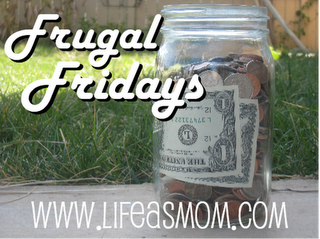 We have enough money in our Health Flex account for 2009 to cover that, so that is blessing #2. Blessing #3 is related... because this cost as little as it did, the rest of us have an eye appointment scheduled next week and we don't have to wait until January. Blessing #4 is that William has definitely maintained some serious improvement in his ability to maintain focus, and his ability to go back and forth from far to near. He & I did get homework though, and we need to spend 15 minutes once or twice a week working on some things at home. What a great day! I'll get a picture of Connor in his new glasses next week after we get them. I don't recall when or how I first heard about Mathletics, but the site intrigued me. I wanted to try it out for my kids, but never had a good chance to do so. Until the TOS Review Crew. As part of the Crew, all five of my children ended up with 45 days of access to the Mathletics website. We love it, and hope to find a way to subscribe at least some of the kids early in 2010. 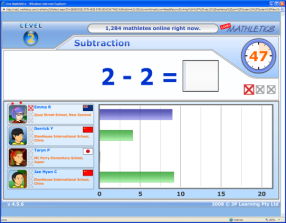 There are a few different aspects to this online math service. Different parts appealed to different kids. 1) They have a grade-based "curriculum" that the kids can work through, doing lessons (with step by step animated help available) and taking tests. We worked with grades K, 1, 3, 5, 7 and 8. The lessons seemed a little on the easy side, but I do have kids who are good at math, so my perspective may be a bit off. Regardless, the lessons cover great math concepts and seem fairly thorough. For US students, there are levels available for K-8. Other countries (Canada, UK, Australia, etc.) have high school levels available also. 2) There is a section where the kids can compete against other kids around the world, live. This is on basic math facts, and it is a race to get the most correct answers, with fewer than three errors. My kids competed against many students in the US, but also quite a few from Australia, New Zealand, the UK, and Canada. And one or two from Africa. My older guys particularly loved doing this, and I heard about any new country flags that popped up. 3) There are games, which you unlock by making progress in the curriculum part. My younger two loved this. Some for the younger ages had to do with creating patterns, others with simple counting, or comparisons of different shapes and colors. In the 5th grade section, one involved a BINGO game using Roman numerals. Games are available for Grades K-6. 4) There are pdf workbooks available for many of the grade levels. Not all grades at this point, but many of them. We haven't used these at all, but I did look four or five of them over, and I liked what I saw. 5) There is a section called Rainforest Maths which also has games and activities broken down by grade levels, K-6. My younger two liked doing these. 6) There are some other options within the parent account for some video demonstrations and other such stuff. So, kid by kid, I'll talk about it a bit too. Connor, age 12, doing algebra and geometry right now. He started in the 7th grade program of Mathletics, found that incredibly easy, and moved to the 8th grade materials. It is mostly review, but it is pretty quick and painless. He loves the live competition, which is great as he can stand a bit more automaticity with his math facts. William, age 11, is working at the 5th grade level. He's found the math to be about perfect, but he really doesn't want to do it. He wants to do the live competition, and it is like pulling teeth to get him to do some of the curriculum. I think this is a great program for him though. The reading required (this is my severely dyslexic one) isn't excessive. Thomas, age 9, is working at the 3rd grade level. He likes basically everything. He is collecting hats for his avatar, and backgrounds. The math is going great, he likes the competition, and he plays some of the games. The math is a great level for him -- easy enough that he doesn't get frustrated, hard enough to at least make him think. Richard, age 5, worked through the kindergarten level in a few days, and is enjoying the 1st grade materials. He loves spending money on stuff for his avatar. He's pretty so-so about the live competition. Trina, age 3, was terribly jealous that she wasn't doing this too. When I let her try out some of the games, she did great. So I ended up getting her a subscription too. She adores buying things for her avatar. She loves the games. She's doing great with the curriculum part. She insists on doing Rainforest Maths. However, I don't plan to buy her a subscription. Maybe when she is actually in kindergarten, we'll see. Mom, age older than dirt, particularly loves the weekly reports that are emailed to me (you do have to opt-in to this, it is not automatic). Very good detail, and I really get a sense for what they have worked on. I like the mix of drill and games. And I can access a fair amount of information about where they are through my parent account too. A few things I don't necessarily like, though, too. First is that there isn't an option to have the text of the math problems read to the child. So that means kids who are not fluent readers do need help, at least some of the time. It's an issue I run into for William all of the time. He's got a great head for math and science, but it's tough to find things he can do that aren't teacher-intensive due to his reading lag. Though I do have to say that he has done fairly well with the reading here. But I think that is why he wants to do the competition and not the lessons. Another minor gripe is that there is a limit as to how many times you can adjust the "grade level" of the curriculum. I am assuming that limit is per year, in which case it is reasonable. But it makes me nervous (or would if I had a one-year subscription) about choosing the right grade level. Connor tends to move through math fairly quickly, and if I start him too low (very easy to do) and move him up, then up again, all in trying to get him placed right in the first place, suddenly, I've used a pretty good chunk of my allotment. Given that he can then probably move through an entire grade in about two months, move again in another two months... well, I could easily run out of the ability to move him up. Recommendation time: I think this is a great set-up, with multiple ways of presenting the math to hopefully appeal to most kids. If you have kids who only want to play games or do the live competition part, you can assign aspects of the curriculum to them so they have to do that first. The price can be a bit steep, particularly for a larger family. A one year subscription runs $59 per child, though right now (and at least through January), if you input 9 as the human calculator's favorite number, you get roughly $9 knocked off that. I think this program is strongest at the upper elementary level, roughly 3rd-7th grades. I don't think I will purchase a subscription for Connor (high school level), as there just isn't quite enough for him. Nor will I purchase one for Trina (though she'd be roughly 4, and is doing kindergarten math) as there isn't as much content and it requires too much hand-holding from me. My 5th and 3rd graders, though, I am going to look very seriously at getting subscribed in 2010. And I'll consider my kindergartner as well, though it would probably make sense to wait another year. Disclaimer: As part of the TOS Homeschool Review Crew, I did receive five 45 day subscriptions to Mathletics for free from 3P Learning. The fact that I received a complimentary product does not guarantee a favorable review. It does guarantee a review. A fair review. But I am not going to praise something unless I think it deserves the praise. If I don't like it, you'll hear that. And hopefully with enough detail as to why so you can decide for yourself if what I hate about it makes it perfect for your family. For more about my take on reviews, visit my blog post here.